This cake is so peaceful and serene that it makes me want to take a nap on a cloud among the stars. From the soft colors of green and yellow to the sleepy bear, this cake captured the dreamy feel of this baby shower perfectly. 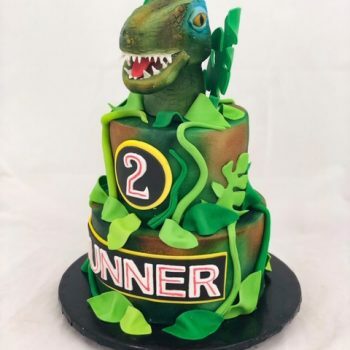 This cake started with a smooth coat of soft sage buttercream on both tiers. 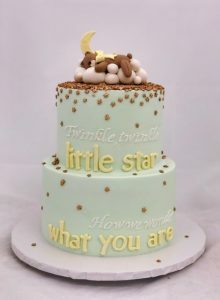 We then added the lettering from the popular children’s song, “Twinkle Twinkle Little Star.” We created this lettering from two different fondant molds. 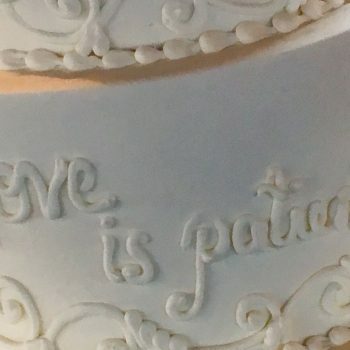 While it would have been simpler to pipe the wording onto the cake, we wanted the contrasting fonts and clean lines that you get from fondant lettering. Once the lettering was on the cake, we added dozens and dozens of tiny gold stars on top of the cake. We had some falling and scattered sporadically on the remainder of the cake as well. For the topper, we created a bundle of fluffy fondant clouds and added the sleeping fondant teddy bear on top. I love the stitching on the bear as well as the coordinating yellow bow. 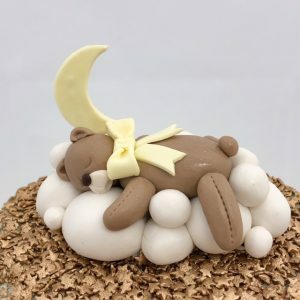 He is so serene as he sleeps under the sliver of the fondant moon. This complete topper was created ahead of time, so that the pieces could properly dry. Once ready, it was placed on the bed of tiny golden stars. This topper is definiely what sweet dreams are made of. I think I need a nap now. Nighty night!